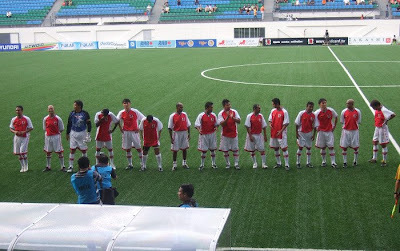 Did some googling around and from one source I read that other than the "GOD" - Robbie Fowler, the new A-League franchise also have the likes of former Geylang United star Brendon Santalab and Ian Ferguson, former Rangers star as its coach. Any Eagles fans who will always remember Santalab for his prolific score-rate in his 22-game stint in 2003 and was nominated for that year's "Young Player of the Year" award. It was also mentioned that the Queensland club are keen to establish a working relationship with any interested party in this region. "It just another game for me and it's good have a good game under my belt as the season is half way through but most important thing are the League and Singapore Cup." 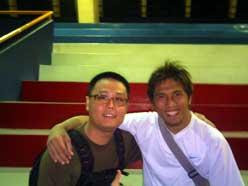 said Tampines ace striker Noh Alam Shah (on left with the blogger in a picture took many donkey years back) on his prospect of facing the Fury this coming Sunday. "For me game vs North Queensland (Fury) or Liverpool is just a matter of me against another player in terms of popularity and well-know (reputation) but it's still a 90-minute game and doesn't matter much whether I (get to) play or not" added "Ah Long" as he's known in the local football fraternity. 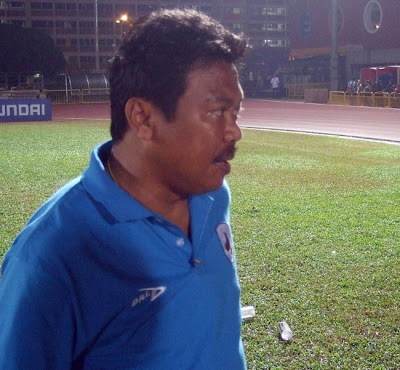 "We'll play our normal game as Robbie Fowler is one player from opposite team" said Tampines Rovers' coach Vorawan Chitavanich (right, file picture) after his team's one-nil victory over Balestier Khalsa in mid-week. "Everybody is the same maybe because of his (Fowler's) reputation but it's good for the Tampines players to play against players who played in top international experience. "It's also a way to find out how our team can play against team of a higher-level but I hope my team would not have any injury problem after this Sunday game. "coach Chitavanich concluded. But barely a day later, it was revealed that the star attraction - Robbie Fowler might not be able to be on the starting lineup as he's still nursing a groin strain that coach Ian Ferguson was quoted, "“We definitely won't take any chances (with Fowler),” “The priority for the Fury is to make sure he's ready for the start of the season." But the matter was put to a rest when I got an email on Friday (29th May 2009), regarding Fowler's status which I post it up as a separate blog entry to avoid "lost-in-the jungle" situation. 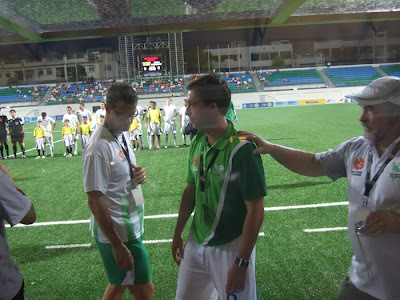 I had a chat with former national skipper Fandi Ahmad after the "Red Card Football Clinic" at Hougang Stadium. "It's a nice reunion for the curtain raiser match for those played in 93 and 94's squads and Sasi (R Sasikumar - the organizer) done a good job for the gathering. "I hope the fans will turn out for this match not just to catch the game but also doing charity by attending this game." added the current Pelita Jaya coach. 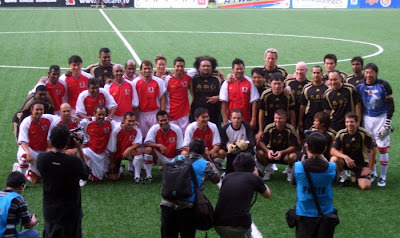 The "Curtain Raiser" - The "Dream Team" vs The "Celebrities"
It was a moment every fan had been waiting for as the "Dream Team" of the 1993-4 graced the field of the Jalan Besar Stadium. Doesn't matter the stadium don't look the same like it used to be but certainly these yesterdays' heroes cherished the chance to get together at the same location of that old arena where they trained and slogged in harmony in the past. Rafi Ali launched his rocket against the "celeb" wall in a dead-ball situation. Abbas Saad (no.21) takes on a defender. The "Dream Team" in defensive mood. 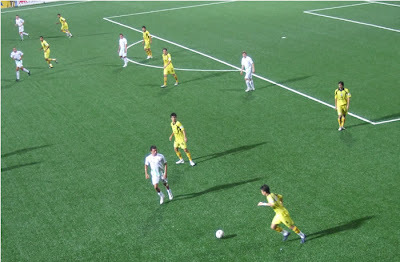 The curtain-raiser ended in an one-nil victory to the "Dream Team" with V Sundramoorthy scored the only goal in the second-half, when he tapped home from close-range off a R Suriamoorthy's cross from the left. “I'm always open and free anytime to come back here, especially for charity in anything we can help.” said former idol Abbas Saad after his first match in Singapore in 15 years. Abbas Saad (2nd from left) talked to the media after the curtain-raiser. “I'll do that and I always do that in Australia and always from my own heart, which I'm sure everybody will do that and it's great we give something back to the game and to the people who really love the game who can't play the game as full professional.” said the Lebanese-born Australian who was idolized by many girls back in the early 90s. “Fantastic, as the (AFC “A” license coaching) course has been enjoyable and obviously (because) the instructor is Vincent (Subramaniam) who is a former coach, and the participants are all former players and it's home sweet home for me, that's for sure.” as Abbas shared with the media his thoughts on the on-going coaching course. “You never say never ( to any offer), if there's any good opportunity comes up and why not because I have the experience in this part of the world as I been here for 20 years and so (once) I got my qualification that should be enough.” when asked if he is keen to coach in Singapore one day. Good to note that these guys are not forgotten after all, as many fans took this golden opportunity to snap pictures with those heroes during the half-time break of the main event. "Where's Robbie?" that was the question in everybody's mind when the "GOD" was nowhere to be seen at the tunnel area. Much to the disappointment of the crowds who turned out hoping to see the "GOD" in action were pretty much disappointed when Robbie Fowler wasn't in the starting line-up! I guess it must be that 'unforseen circumstances" that coach Ian Ferguson said before-hand and so the ex-Liverpool star was benched. Anyway, the hosts almost credited themselves with the opening goal as early as in the first minute when Qiu Li burst through the yet-to-be-tested Queenslanders' backline but 'keeper Justin Pasfield passed his first test of the night when he got down well to deny the would-be opener. I guess the man's focus would have been on the field if the "GOD" played, just as he contended reading the papers instead. "Disappointed as I came all the way to see him (Fowler) play, just hope I can see him play at least five or ten minutes before the end of the game." said CJ, a Liverpool fan stayed in Bishan. "Ridiculous! At least they should informed the fans before-handed but anyway too bad for the (Fowler's) fans, I'm here to support Tampines not Fowler." said Leon, a Stags fan. It was a rather physical game. And it was found out that five minutes before the game, the Queenslanders decided that it was not in the best of their interest that Fowler in action, so end of the story. However, another fan named Mohamad was more understanding as he said if Fowler is really injured, it's best not to field him, rather than risk him for further injuries. 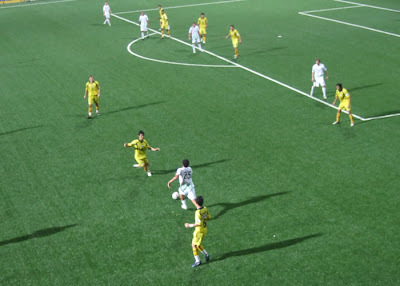 Some action photos from the terraces. 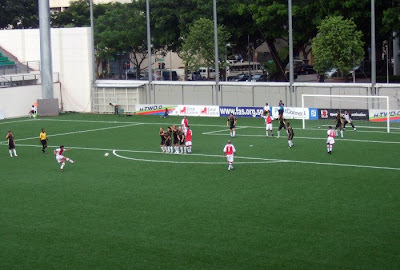 In a match that was rather highly-physical and intense saw defender Shariff Samat sent off in the 51st minute when he held back a Fury player in his attempt to win the ball. 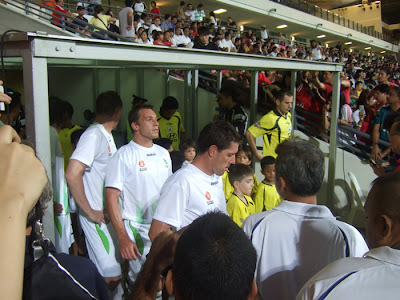 Robbie Fowler addressed the crowds and explained a "slight niggling" forced him to sit out of the game. 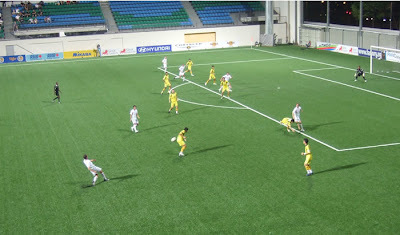 Despite having that extra man advantage, the visiting side failed to make a full use of it and succumbed to a one goal defeat in the end when substitute Fathi Yunus scored in the 77th minute having nicely latched onto another replacement, Edward Tan's through ball that broke down the Fury's defence. 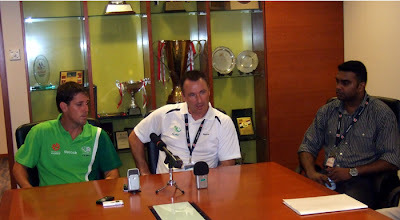 “Tampines gave us a good test” said Fury's Scottish coach Ian Ferguson (pictured above, center with match organizer R Sasikumar on his left). “It was decided last night that not to field Fowler after reviewing by the coaching and medical staff following the recurrence of the injury.” said the former Rangers player when quizzed why the star attraction – Robbie Fowler was missing in the starting and bench line-up. “Everywhere, definitely, need to be improved as I said this is our first game and we got a lot of things to do but I'm happy that we played reasonably well”added coach Ferguson when asked what are the areas need to be addressed following the game. “I think we are disappointed obviously” said R Sasikumar, the match organizer. “But in the end of the day we didn't invite him (Fowler) all the way to seat on the bench, I'm sure in some stages like (coach) Ian Ferguson had said that obviously it's the injury and that's the coaching personnel's job (to decide) whether he gets to play or not and as promoters we can only hope we can bring in more big names like him to Singapore. 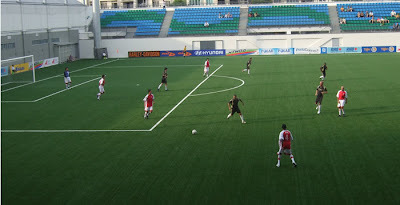 “But in the end of the day, he's (Fowler) a human being and we have to take his health into consideration and like I said I left it to the coach to decide whether to play him or not” said the former national defender whose famous “shoulder blade goal” claimed the country's first ever regional title in 1998 – Tiger Cup. 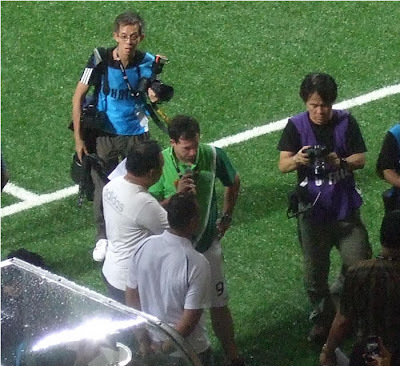 Syed Faruk - the Tampines' team manager addressed the media. "Disappointed and not just me but the boys as well for not able to play against Fowler." 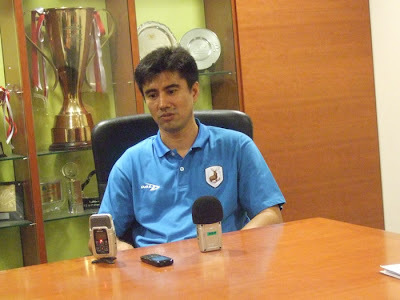 said Syed Faruk, the Stags team manager in his team's media gathering on his team's sentiment for not able to play against the former Liverpool legendary striker. "We told the boys before the game that this is just a friendly game and we don't want to have any injury from this game but I think as a player they just went in hard." commented Faruk on his take of the physical nature of the game. "At least with this win, it shows that we are not overawed by team who have players who played in higher levels than us" he added. But i am just a supporter of the stags... i am hardly a fan~ LOL! 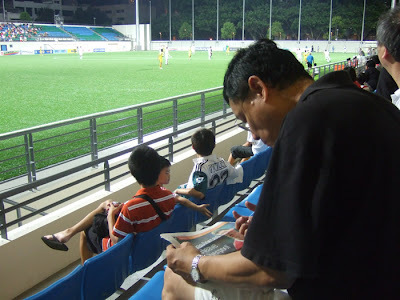 Following the 1-0 loss to Tampines Rovers the Journal is pleased to forward a match report & reaction from well known Singapore football blogger Bolasepako who attended last night’s match at the Jalan Besar Stadium, Bolasepako has forwarded comments on both the match along with reaction of fans who were in attendance. (While the English Language is a little raw we are sure you will get the drift of what Bolasepako is aiming to get across)"